"I actually think we're going to solve this thing." That's what President Obama said in a news conference just before he left a United Nations summit on climate change. "Climate change is a massive problem," Obama said. "It is a generational problem. It's a problem that by definition is just about the hardest thing for a political system to absorb, because the effects are gradual, they're diffused. And yet despite all that ... I'm optimistic. I think we're going to solve it." Just a few years ago, Obama said, nobody would have predicted that more than 150 leaders would come to Paris holding plans to cut greenhouse gas emissions. "All of this will be hard," Obama said. "Getting 200 nations to agree on anything is hard ... but I'm convinced that we're going to get big things done here." Obama leaves the conference, but his deputies will remain in Paris in an effort to craft a global, legally binding agreement intended to curb climate change. The big goal: to keep the global temperature from rising by more than 2 degrees Celsius. At the moment, if you add up all the commitments on the table at the summit and assume that they would be met, the temperature would still rise by 2.7 degrees, Obama said. "That's too high," Obama said. But "what we expect is that we'll hit these targets faster than expected and ... we could pick up the pace." Obama said that is not just "foolish optimism" but an expectation based on past experience. The United States, for example, was able to meet its goals faster than expected. "The key here is to set up the structure so we're sending signals all around the world that says this is happening and we're not turning around," Obama said. -- Obama says that the fact that the peace process for Syria is progressing in Vienna is a sign that Russian President Vladimir Putin "realizes there is not going to be a military solution to the situation in Syria." Eventually, Obama said, he expects the Russians to shift their focus in Syria from trying to prop up the regime of Bashar Assad to fighting the Islamic State. "I think Mr. Putin understands that for him to get bogged down in an inconclusive and paralyzing civil conflict is not the outcome that he is looking for," Obama said. In other words, Obama said, both the U.S. and Russia agree that the only lasting solution in Syria will be political. "Where we continue to have an ongoing difference is not in the need for a political settlement; it's whether Assad can continue to serve as president as that transition goes on," Obama said. Russia believes Assad should play a role, and Obama believes that "it is impossible for Mr. Assad to bring that country together." 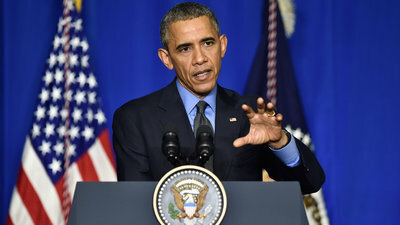 -- On the shooting at a Planned Parenthood clinic in Colorado, Obama said Congress should act. Just as the country takes huge, costly steps to fight terrorism, it has to take steps to reduce gun homicides. "At the end of the day, Congress, states, local governments are going to have to act in order to make sure that we are preventing people who are deranged or have violent tendencies" from getting weapons that magnify the damage that they can do, Obama said. Earlier in the day, President Obama urged Turkey and Russia to ease tensions by focusing on a common enemy: the Islamic State. The relationship between the two countries has been frayed since Turkey downed a Russian jet in November. Turkey has refused to apologize, saying the Russian warplane crossed over into Turkish airspace. Russia has implemented a series of sanctions. Reuters reports that Obama said the United States supported Turkey's right to defend its airspace, but he also urged the two countries to "de-escalate tensions." "We all have a common enemy. That is ISIL," Obama said using an acronym for the Islamic State, according to the AP. "I want to make sure that we focus on that threat."